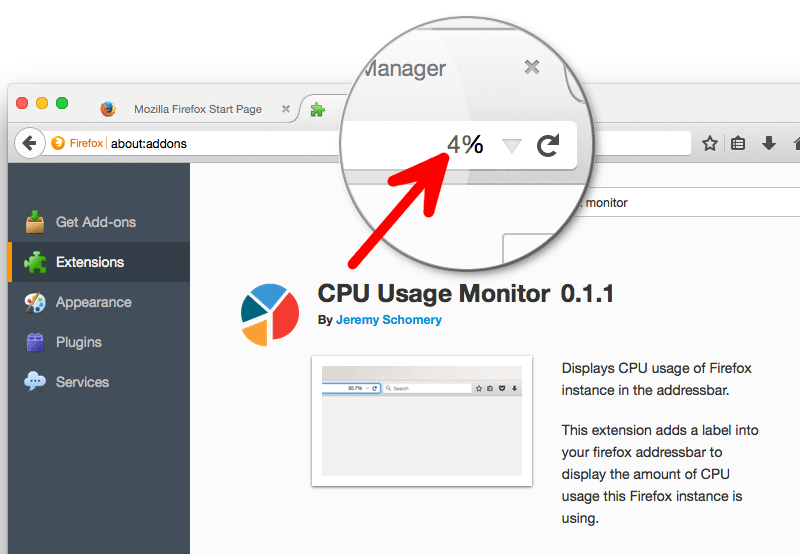 "CPU Meter" is a Firefox extension to monitor CPU usage of the browser with its plug-ins. It uses the OS specific low level functions to find the actual CPU usage of the browser. Read FAQ to find out more on how the CPU is measured on your OS. What is CPU Meter extension? CPU meter is a tiny Firefox extension to monitor the actual CPU usage of the browser by resorting to low level OS depended APIs. It displays the CPU usage right in Firefox addressbar adjacent to the refresh button (considering the position of the refresh button is not being changed). The CPU value is color coded between two levels (highest and lowest). Can I change the color values of the lowest and highest CPU measures? Yes, open the extension's option page. There are two color selection options there. By changing these values, the color of the current usage will be calculated based on the two newly selected values. Can I change the time interval between two CPU usage calculations? Yes, in the options page, there is a time interval option to check CPU usage. Note that minimum acceptable value for this preference is one second. How does CPU usage is calculated in Linux and Mac OS? In the Linux based OS, ps (report a snapshot of the current processes) is used to fetch the CPU usage of the current Firefox instance using pid -o %cpu arguments. Read more about ps here. Since ps accepts PID (process identifier), the CPU Meter extension is able to calculate the Firefox usage even if multiple Firefox instances are simultaneously available. How does CPU usage is calculated in Windows OS? In Windows OS, typeperf is used to calculate CPU usage. typeperf is used to write performance counter data to the command window, or to a supported log file format. Read more here. On oppose to Linux ps command, typeperf is not accepting PID as an input argument. That means the extension cannot differentiate different Firefox instances from each other in the Windows OS. There is no workaround for this at the moment. Where can I find the change logs of the extension? There are two logs. If you head to Mozilla's website you can find a short log of the changes. For more comprehensive log, please check the commit logs at GitHub's page. Can I change the position of the CPU meter on Firefox UI? No, not currently at least. I tried to place the UI in the addressbar to prevent Firefox UI cluttering. If you have a better place, please open a new bug in the GitHub repository to discuss it. Does CPU Meter provide information about Firefox memory usage as well? No, however, you can check my the other project, Tab Memory Usage for in-tab memory usage report. Or Performance Reporter extension by Blav for memory usage of extensions (This extension currently only works on Firefox Nightly).